One of my favorite historical accounts found in Scripture is that of David’s fight with Goliath. When you read about this confrontation in 1 Samuel 17, there are several points that are worthy of one’s consideration. David is at home taking care of the sheep while his three oldest brothers are with the Israelite army fighting the Philistines. I imagine that David must have dreamed about what it might be like to be on the battlefield instead of watching some smelly old sheep. One day, his father gives him food supplies and sends him to check on the battle. David is to go and see how his brothers are doing and bring a report home to his father. David must have been excited to be asked to get the opportunity to go where the fighting was taking place. Scripture records that David got up early and hurried to the battle front. He dropped off the supplies and went looking for his brothers. As he approached the army of Israel his heart must have started racing as we find the following account taking place. These words paint a great picture of what David was about to experience. He arrived in time to see the army going out to fight. He could hear the shout of the soldiers in unison as they assembled in military formation. David probably thought to himself that he had arrived just in time to see the mighty Israelite army fight against its enemy, the Philistines. Here an interesting twist takes place that caught David by surprise. David had found his brothers and was talking with them when a huge man, named Goliath, stood on the hillside opposite of where the Israelites had drawn up in military formation. David heard this man mock the army of Israel and, even worse, blasphemed their God. I wonder if the thought raced through his mind that God’s mighty army was going to rise up and take this evil person out. However, something unexpectedly took place. 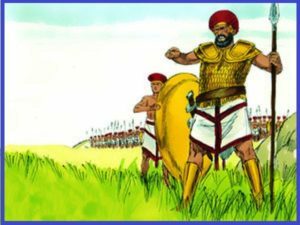 Instead of going to fight this giant, the Israelite army turned and ran away from him in fear. David was shocked. The entire army went and hid in their tents because of the threatening words of one man. Again, I envision David becoming a flap flipper. David appears to go to the soldiers, flip the flap of their tents and start asking them what they were doing cowering inside their tents. This young teenager couldn’t believe that they were letting one man mock the God of Israel and not standing up to him. This must have mystifying to David. Then something else took place that may have caught David my surprise. David’s oldest brother catches up with him and says the following. Instead of feeling guilty for not standing up for God and confronting Goliath, Eliab gets mad at David and accuses him of rocking the boat. In essence, David’s brother, wanted him to quit stirring up trouble and simply go back and tend their father’s sheep. After all, the Israelite army would get in battle formation and go through the military maneuvers on a regular basis. Whenever Goliath would raise his ugly head, they would break rank, go to their tents and wait until Goliath was through. Then they would gather again in formation and continue with their drills. Everything was fine. 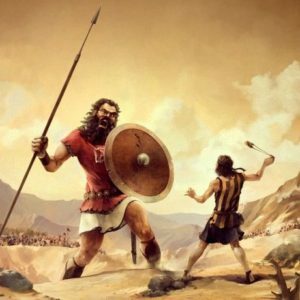 Goliath inflicted no actual harm and after his spewing of hatred toward God and His army, he would retreat and the army could go back to its normal routine. The word “cause” often referred to a decree or commandment. Many times its use conveyed the idea of divine communication. We can determine that what David was asking was, Hasn’t God said something about a situation like this? Doesn’t God expect His people do something when His name is being profaned in the way that Goliath was doing? We know that David was willing to take up this cause and ended up being the person that God would use to defeat Goliath. In light of all of this, I see a similar situation taking place in God’s army, His church, today. If I were to go to the battle ground on any given Sunday, I would see a mighty fighting force gathering together and going through their military maneuvers. They would shout out in unison songs telling of the greatness of God and they would hear from some of their military leaders words of encouragement and the need to remain faithful to the Lord’s commands. There would be a sense of excitement as I experienced the worship that I would witness. However, I would experience something like David experienced if I stayed around the week following the Sunday worship time. Then I would witness a giant come forth and start defying the God that Christians had just gathered to worship on Sunday. He would declare that this God wasn’t so great and even mock His existence. It would be at this point that if I were to start asking church leaders and other Christians why this was being allowed to take place, I would be told not to rock the boat. They might tell me that every Sunday they gathered together and would join in going through some dynamic military maneuvers. Then on Monday through Friday, this giant would come out and start mouthing off about God etc. However, by the end of the week, he would go back into his camp and God’s people would gather once again to sing, shout and hear the Word of God preached. No harm – no foul! My question is, Is there not a CAUSE? Doesn’t God expect us to do something when His name if being profaned in the way this modern-day giant is doing? You may be wondering who is this giant I am writing about? Today’s giant that stands against God is secular education. Every day a vast majority of our children and youth listen and learn from this giant how man is the center of everything and God simply isn’t important or doesn’t even exist. God’s name is being profaned and yet, many of His people, don’t do a thing about it. What was David’s cause or motivation that led him to be able to defeat Goliath on that memorable day? 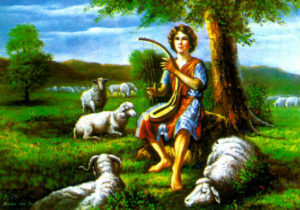 David’s cause is recorded in verse 46. As another school year comes to a close and many start planning for next year, I want to challenge Christians everywhere to recognize the cause for why we are in this battle. Our cause must be that future generations will know that there is a God in our lives, our homes, our churches and our schools. It is the only cause worth fighting for! So well expressed. What is our stone and sling? Have we a strategy? I wish you weren’t right Glen. I wish we could just go on enjoying “the good life” and ignoring the enemy that is so obviously attacking every biblically based, foundational principle of our families and society. But the fact is that every time we take a step back by compromising on truth or otherwise avoiding unpleasant confrontations, our enemy takes a step forward.